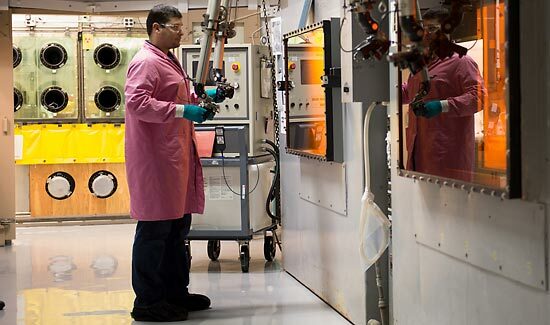 The Irradiated Materials Laboratory (IML) in Argonne's Nuclear Engineering Division is used to conduct research on the behavior of commercial nuclear reactor materials, including fuel, pressure vessels, and other in-reactor components. 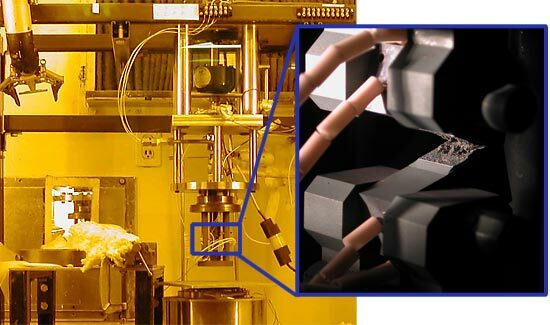 The four beta-gamma hot cells and the glove boxes are used to determine mechanical properties of these materials and degradation due to long-time operation in corrosive and irradiation environments. Loss-of-coolant accident (LOCA) environment is also simulated to allow determination of post-LOCA cladding ductility. 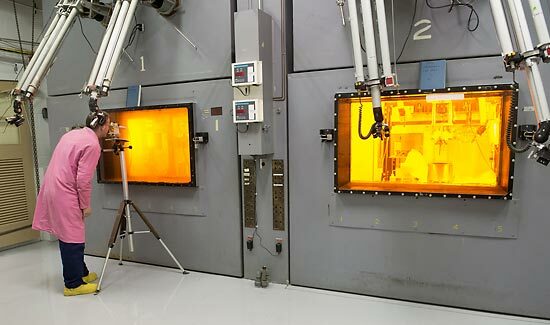 Hot Cells for mechanical testing of LWR materials at Argonne's Irradiated Materials Laboratory. Hot cells and Glove Box for LOCA and Mechanical Testing of LWR Cladding. Reactor Materials: Crack Growth Rate Test System. 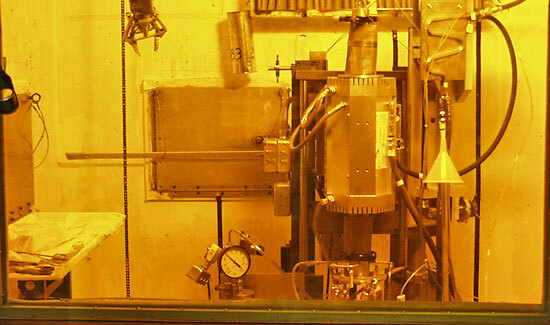 Cladding Sample Preparation: Remotely-Operated Electric Discharge Machine. Cladding Testing: LOCA Integral Test Apparatus. The Irradiated Materials Laboratory (IML) has capabilities for handling, testing, and analyzing irradiated materials. The facility was designed to conduct postirradiation examinations of structural components for reactor development. Capabilities have been expanded to include testing of reactor components and fuel–rod cladding. The research has helped increase knowledge of irradiated materials behavior and properties for commercial power reactors and research reactors. The facility has also been used to provide data for development and testing of advanced alloy materials for the DOE fusion program. 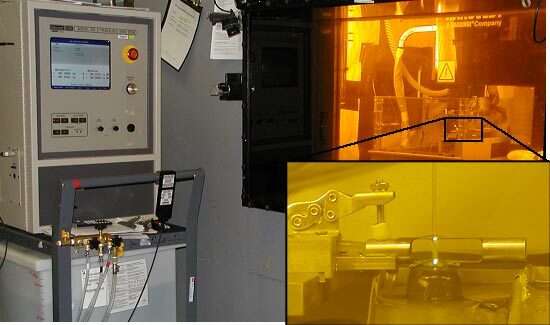 Testing capabilities include tensile and creep–rupture under vacuum or inert atmosphere up to 800°C, slow–strain–rate tensile testing (SSRT), fatigue and SCC crack growth rate (CGR) tests up to 320°C in controlled PWR and BWR water environments, fracture toughness testing up to 320°C in a controlled water environment, instrumented Charpy–impact testing (drop–weight system) to –190°C, and a LOCA integral test apparatus for subjecting irradiated cladding to high–temperature steam oxidation followed by cold–water quench. Sample preparation capabilities include a remotely operated electric discharge machine (EDM) for cutting precise test specimens from irradiated materials. The IML consists of four air–atmosphere, centi–curie beta/gamma hot cells. The interior of each cell is 6–ft wide x 5–ft deep x 9.7–ft high and is maintained at a negative air pressure. Each cell is equipped with movable doors that allow the cell equipment to be easily installed, removed, and reconfigured to support the mission of the cell. One cell has a 0.5–ton hoist for removal of vertical cask lids. Multiple 4–in. diameter and two 12–in. diameter access ports on the side wall of each cell. Multiple internal ports connect the four cells. Viewing windows at the front (30 x 50 in.) and side (12 x 18 in.) of each cell. Three laboratory hoods for sample preparation. Instron 8511 servohydraulic driven tension/compression/ cyclic testing machine in radiological glovebox with Pb–glass shielding for contaminated and activated materials. Integral radiant furnace capable of test temperatures up to 1300°C and burst pressures of 2000 psig in flowing gas environments. Custom–built SSRT and CGR apparatus capable of testing in water or gas environment up to 320°C. Modified Instron 8500 and 8800 dynamic testing systems capable of fracture toughness and fatigue studies (1/4 or 1/2–T CT) in water or gas environment up to 320°C. Hansvedt DS–2 Electric Discharge Wire–Cutting Machine with Computer Numeric Control (CNC) for remote machining of precise test specimens from irradiated materials. Minimum wire size is 0.004” and CNC precision is ±0.0002”. Macro–cameras for magnifications from 1X to 20X. Jet polishing apparatus for preparation of TEM specimens. High–temperature furnaces (radiant and resistance), computer–controlled for controlled heating cycles up to 1400°C. Pb–glass–shielded gloveboxes for optical microscopy specimen preparation and imaging . Astro Arc (TIG) welder and pressurization/laser–welding system for fabricating sealed, high–burnup cladding rodlets. Programmable furnace used to simulate drying/storage temperature histories for used–fuel cladding. LECO machines for measuring oxygen, nitrogen and hydrogen contents of irradiated materials. Electron Microscopy Center, with its 1.2– MeV electron microscope and high–resolution analytical microscope. Advanced Materials Fabrication Facility providing alloy preparation and casting, secondary fabrication, assembly and welding, and inspection services. Scanning and transmission electron microscopes to examine radioactive specimens. Engineering Development and Applications Dept.